We're Looking for a Fight! And, unfortunately, we're finding them. Animal fighting is happening right here in our community. This brutal blood sport claims victim’s everyday and it is up to us to stop it. The Unconditional Love Foundation is dedicated to putting an end to animal fighting and is sponsoring a community awareness campaign. This awareness campaign takes our message to the streets. The campaign includes posters and postcards distributed throughout the community. The message is important and straightforward. We're looking for information about animal fighting and we're willing to pay for it. Up to a $5000 reward is possible if your animal fighting tip leads to an arrest and conviction. What can you do? Help! Help by donating your time, talents or dollars. 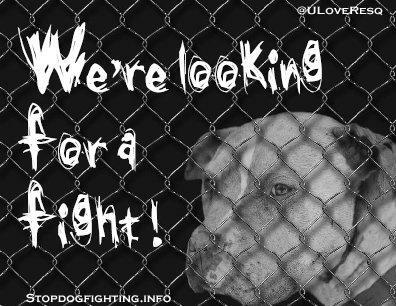 If you have ideas about how to communicate our anti-animal fighting message to an even larger audience, call us at (877) 332-RESQ or e-mail us at Stopdogfighting@aol.com. If you are able, send your tax-deductible donations to Unconditional Love Foundation’s Athena Fund, making it possible for us to expand our campaign to reach even more people. Above all, pay attention. If you suspect fighting call your local authorities and Animal Control with any information related to animal fighting and 911 if you witness a fight in progress. Remember, reporting animal fighting will reduce violence and illegal activities in your neighborhood! The next victim could be someone you know and love.